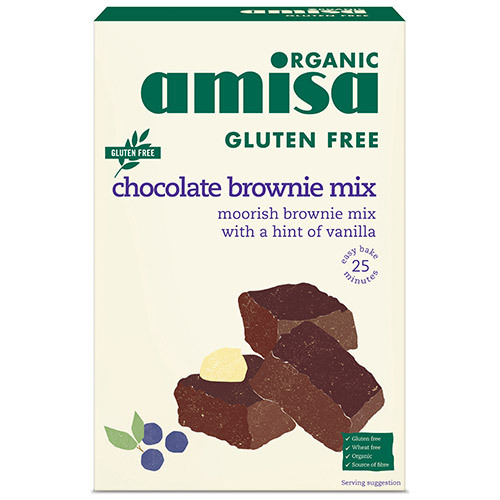 Amisa Organic Chocolate Brownie Mix is a moreish brownie mix with a hint of vanilla. Easy to bake in 25 minutes. Enjoy a brownie by itself or indulge yourself and serve with fresh berries and ice cream. Wholegrain rice flour*, raw cane sugar*, dark chocolate drops* 15% (raw cane sugar*, cocoa mass*, cocoa butter*, emulsifier: sunflower lecithin), cocoa powder* 8%, wholegrain millet flour*, thickener: carob bean gum*, bourbon vanilla*, sea salt. Simple to prepare with step-by-step baking instructions. Preheat oven to 175°C. Mix contents with 200g melted butter, 2 eggs and 125ml milk and stir until smooth. Pour the mixture into a tray (approx. 20cm x 20cm) and bake for 25 minutes. 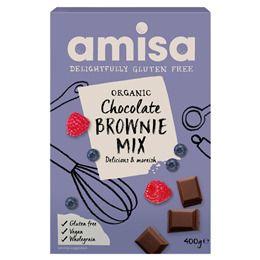 Below are reviews of Amisa Organic Chocolate Brownie Mix - 400g by bodykind customers. If you have tried this product we'd love to hear what you think so please leave a review.